Faron Pharmaceuticals’ antibody drug candidate that targets the macrophage receptor Clever-1 may be a game changer in immuno-oncology. Targeting the ability of cancer cells to evade the immune system is revolutionizing cancer treatment for some patients. Therapeutic antibodies that block the interaction between the immune checkpoint programmed cell death 1 ligand 1 (PD-L1) and its receptor on T cells, PD-1, have been approved for several cancer types. Unfortunately, up to 80% of patients do not respond to this treatment approach, highlighting the need for complementary strategies to improve the response rate or new strategies to activate the immune system against tumor cells. Faron Pharmaceuticals, a publicly held Finnish biopharmaceutical company founded in 2007, has developed a humanized antibody against common lymphatic endothelial and vascular endothelial receptor-1 (Clever-1) that shows promising effects both as a monotherapy and as a combination therapy in preclinical cancer studies. The anti-Clever-1 antibody Clevegen (FP-1305) entered phase 1/2 clinical trials to assess safety and initial efficacy in patients with hepatocellular carcinoma, metastatic melanoma and pancreatic, ovarian and colorectal cancers in December 2018. The first results from these first-in-human trials are expected toward the third quarter of 2019. Clever-1 is a multifunctional receptor that binds to many ligands. It is found on a subpopulation of immunosuppressive macrophages that dampen the activation of tumor-killing T cells. Macrophages expressing Clever-1 have been detected in many human cancers, and high levels of Clever-1 expression are associated with poorer prognoses in colorectal, liver, ovarian and breast cancers, as well as glioblastoma. “We believe that inhibiting Clever-1 is key to increasing responsiveness to cancer immunotherapy and could represent an entirely new therapeutic approach for people with incurable disease,” said Juho Jalkanen, chief development officer at Faron. “A key advantage of targeting Clever-1 is that its expression on circulating monocytes is higher in cancer patients providing a basis for liquid biopsy. Clever-1 levels in blood samples may be used to accurately predict antitumor immune responses during patient selection and treatment assessment,” he added. Macrophages detect, engulf and destroy invading pathogens. However, when recruited to a tumor environment they adopt a ‘healing’ rather than ‘defensive’ role that dampens inflammation and favors tumor growth and the formation of new blood ves- sels. Macrophages that elicit these protumor effects do so in response to anti-inflammatory signals and are referred to as alternatively activated M2 macro- phages. Conversely, classically activated M1 macrophages respond to inflammation and microbial toxins and boost immune activity not only against viruses and bacteria, but also against cancer cells. The possibility of interfering with the recruitment, sur- vival and function of tumor-associated macrophages (TAMs) has attracted a lot of attention and several drugs that target these processes are in clinical trials. The most advanced are agents that target the colony-stimulating factor 1 receptor (CSF-1R), but these agents mainly cause macrophage depletion and show substantial toxicity over time. “Given the emerging evidence of the importance of interactions between TAMs and other immune cells, depleting them is not necessarily the most effective way of turning on the host immune’s system against cancer cells,” explained Jalkanen. Faron’s approach is to reprogram macrophages in the tumor microenvironment so that they support anticancer immune responses. Clevegen targets Clever-1-positive TAMs and redifferentiates them away from protumoral (M2) states and toward antitumoral (M1) states. These re-educated TAMs can attack cancer cells themselves and induce the secretion of inflammatory signals that recruit cancer-killing T cells and antibody-producing B cells, effectively vaccinat- ing the host against tumor antigens (Fig. 1). Fig. 1 | Turning on your immunity. Clevegen switches immunosuppressive M2 macrophages to immune-stimulating M1 macrophages, activating the host’s immune system against cancer cells. Transplanting cancer cells into mice lacking Clever- 1-expressing macrophages and into wild-type mice treated with anti-Clever-1 antibodies led to the development of smaller primary tumors and fewer metastases compared with controls. The higher infiltration of immune cells into these tumors suggests that Clever-1 deficiency contributes to unleashing the body’s immune system against them. Interestingly, anti-Clever-1 antibodies performed better than anti-PD-1 antibodies in a mouse model of lung cancer and reduced tumor growth in a triple- negative breast cancer model that is resistant to anti-PD-1 treatment. In this model, an anti-Clever-1 and anti-PD-1 combination treatment dramatically reduced tumor viability and prevented lymph node metastasis, highlighting the synergistic benefit of combining the two immunotherapies in this other- wise nonresponsive cancer model. Faron’s Clevegen antibody caused no obvious side effects in primate toxicology studies and is the first antibody of this kind to enter clinical trials. In collaboration with Helsinki University Hospital and Oulu University Hospital, Finland, The Royal Marsden Hospital and the University of Birmingham Centre for Liver Research, UK, and Erasmus Rotterdam, the Netherlands, Faron has started the Macrophage Antibody FP-1305 To INhibit immune Suppression (MATINS) trial that will examine the safety, tolerability and preliminary efficacy of repeated doses of Clevegen in patients with advanced solid tumors. To further investigate the effects of Clevegen in combination with currently available immunomodulating drugs, Faron seeks to establish new commercial partnerships. 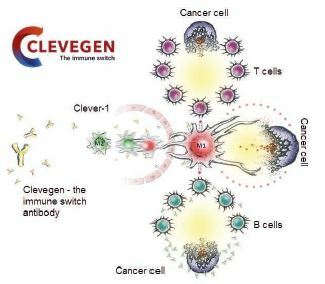 “Clevegen could be a game changer not only for immuno-oncology but also for a range of indications in which the body’s defense mechanisms are compromised, such as chronic infections and autoinflammatory diseases,” concluded Jalkanen.